Hollywood actress, Maureen O'Hara, dies aged 95 ~ CK Jacob: Nigerian Fiction And Lifestyle Blog. 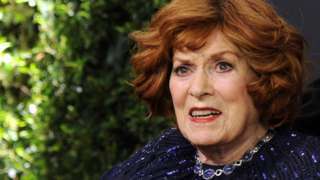 Irish-American actress Maureen O'Hara has died. She was aged 95 years old. She died in her sleep at her home in Boise, Idaho. The actress was Born in Dublin, she moved to Hollywood in 1939 and later became a US citizen. Maureen starred in the 1941 multi-Oscar winning drama, 'How Green Was My Valley', set in a Welsh mining village. She also regularly featured alongside John Wayne, in films such as the Quiet Man. "Her characters were feisty and fearless, just as she was in real life," her family said in a statement. "She was also proudly Irish and spent her entire lifetime sharing her heritage and the wonderful culture of the Emerald Isle with the world." Ireland's President Michael D Higgins said "she will be remembered as an outstanding and versatile actress, whose work especially in film, will endure for many years to come".